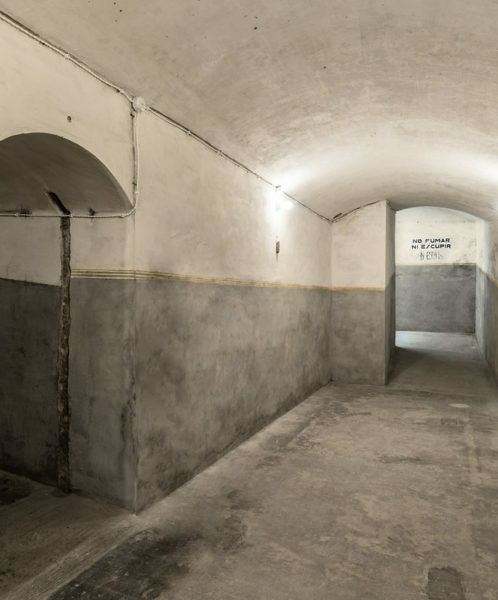 During the restoration of the old Bombas Gens factory, an underground shelter built during the Spanish Civil War was discovered. The shelter was used to protect the factory workers from possible attacks by the National Army, either by air or by sea. The reason for those attacks was because during the war, the furnace at Bombas Gens had stopped producing hydraulic machinery in order to manufacture armaments such as mortar grenades. This is a factory type shelter, its small size and capacity providing refuge for thirty to forty people. Being a military defensive structure, it is a solid construction of reinforced concrete that complies with the norms of this type of structures and is therefore underground. It has a separate entrance and exit and contains elements that protect its interior from blast damage and shrapnel from exploding bombs nearby. 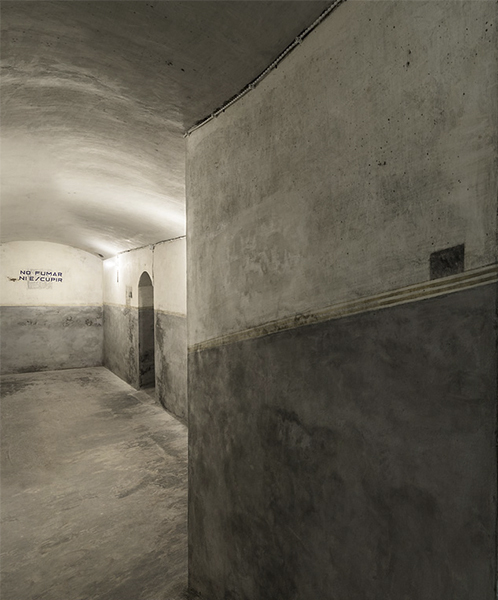 The interior of the refuge is a vaulted, rectangular room, almost intact and practically unchanged since its construction. The walls are painted with a grey-coloured skirting board over which runs an ornamental band composed of alternating yellow and white lines. On the walls a peculiar set of signs can be seen, with a series of sanitary indications banning, for example, smoking, spitting and throwing litter. These health warnings were aimed at the factory workers gathered inside. At the entrance landing we find another sign, this one forbidding people to remain there – as it wasn’t a secure area. Today, these signs are one of the most distinctive features of the shelter. 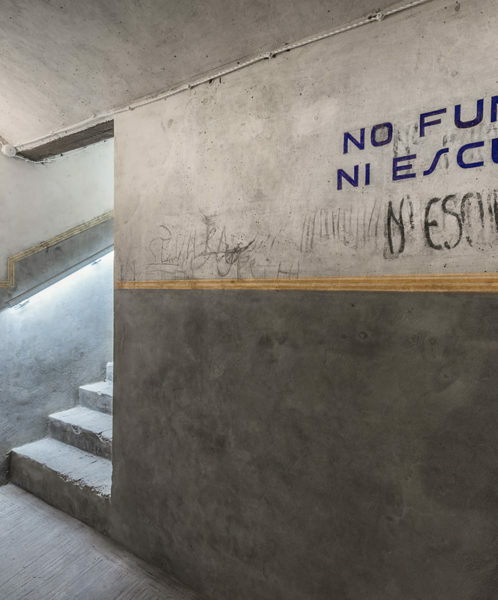 They are painted in indigo (azulete) and composed of capital letters with the typical sign making typography of that moment. 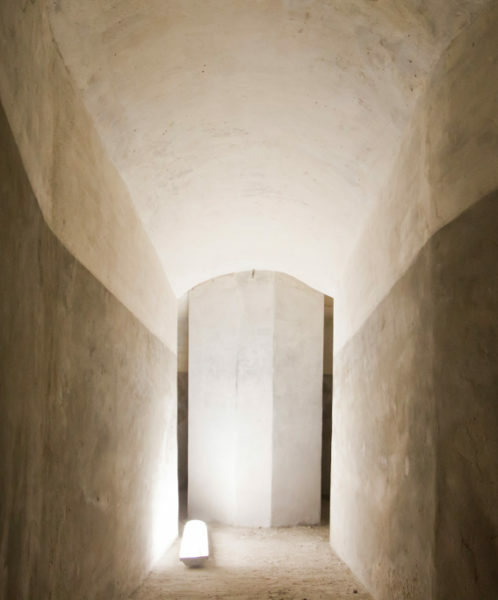 The remnants of the shelter’s lighting and ventilation systems were preserved during restoration. 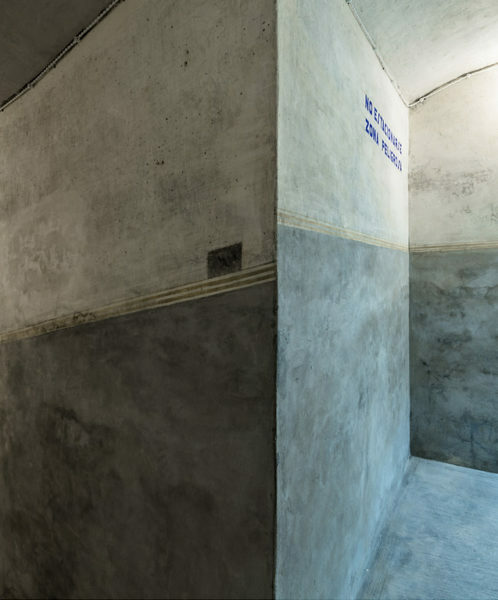 To provide workers inside the shelter with the best possible protection, a thick concrete wall 2.30 meters wide was built between the stairs and the room, and used as a shield. At the exit, serving the same purpose, two elements were installed as barriers: one, a sturdy octagonal column of 1.10 meter thick placed to stop the impact of an explosion, and the other, a metal sheet fitted into the wall. One piece of armament built in Bombas Gens is exhibited in the interior of the shelter. It is an empty shell case, missing its fuse and other parts, indicating it was never used. The shelter has been restored and reconditioned for visits (only guided visits). More information in this video. Its purpose was to provide refuge to the factory workers and protect them from attacks.